Alberta signaled Thursday it’s prepared to escalate its fight with British Columbia over the Trans Mountain pipeline by cutting off oil exports if obstruction of the $7.4 billion expansion continues. The drastic option is both a throwback to the past and a sign of things to come: regardless of who wins power in the next Alberta election in just over a year, which is expected to be hotly contested thanks to the re-unification of conservatives led by Jason Kenney, expect the province to be more aggressive to protect its interests. 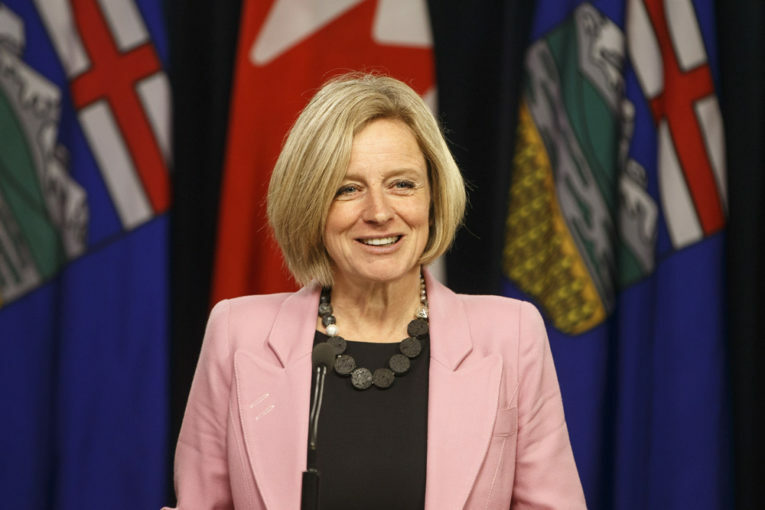 In the NDP government’s speech from the throne Thursday, Rachel Notley said the province intends to do whatever it takes to end British Columbia’s pipeline blockade. “Some people have asked how far we are willing to go,” Alberta Lieutenant Governor Lois Mitchell said in the speech, which had the flavour of a campaign platform as Notley enters the final stretch of her four-year term. “Today, we affirm we will do whatever it takes. In the past, when workers in our energy industry were attacked and when the resources we own were threatened, premier Peter Lougheed took bold action,” Mitchell said, referring to the late premier’s 15 per cent reduction of oil flows in the early 1980s to eastern refineries to retaliate against the federal government’s National Energy Program. It’s the latest play in the trade war between the neighbouring provinces, triggered by opposition by the B.C. government to allow an increase in Alberta bitumen exports, regardless of federal authority and approval. Speaking to the media, Notley said Alberta is giving itself the greatest range of tools and flexibility, while hoping it doesn’t have to use them. Notley previously cancelled talks to purchase B.C. electricity and followed up with a boycott of B.C. wines, then called that off after B.C. backed down on a scheme to further delay the project by studying the behaviour of bitumen. While hostile to the oilpatch in the early days of her mandate, Notley has led the defense of the Trans Mountain project. Her resolve is playing well in Alberta, where there is widespread disillusionment over other province’s refusal to allow passage of its resources — depressing government revenue, investment and job creation. For example, there are plans to promote diversification within the energy sector through more bitumen upgrading and refining, diversification of the economy by subsidizing the tech sector, and doubling down on renewable energy. The remedies don’t sit well with Alberta’s United Conservative opposition party, which wants to see less government spending. Yet the party also supports an oil embargo against B.C. Kenney, who took his seat in the Alberta legislature for the first time Thursday after winning a byelection, would push a trade war with B.C. even further if necessary, such as by slapping a toll on B.C.’s natural gas shipments through Alberta. Cutting the flow of oil from Alberta would wreak havoc in B.C. Motorists in the Lower Mainland would face even higher gasoline prices and Vancouver Airport would have to line up new suppliers. Fuel supply is already so tight that prices have been pushed to record highs of $1.50 a litre in some locations by maintenance at the Burnaby refinery. They could go higher in the summer because of planned maintenance at nearby refineries in the U.S. and because of the higher U.S. dollar, GasBuddy senior petroleum analyst Dan McTeague told Canadian Press. All of Alberta’s oil to B.C., about 300,000 barrels a day, is transported on the Trans Mountain pipeline, which has been in operation since 1953. B.C. opposes the plans to nearly triple capacity because it believes it would increase the risk of oil spills. An oil embargo would also hurt Alberta’s oil industry, which is not enthusiastic about losing money after years of weak oil prices. Notley has appointed a task group to look at other retaliatory measures, yet the oil embargo’s continuing prominence shows there aren’t a lot of gentler options available to get the attention of B.C.’s NDP/Green government, which regards oil as dispensable and Alberta’s lack of market access as indicative of its over-reliance on fossil fuels.